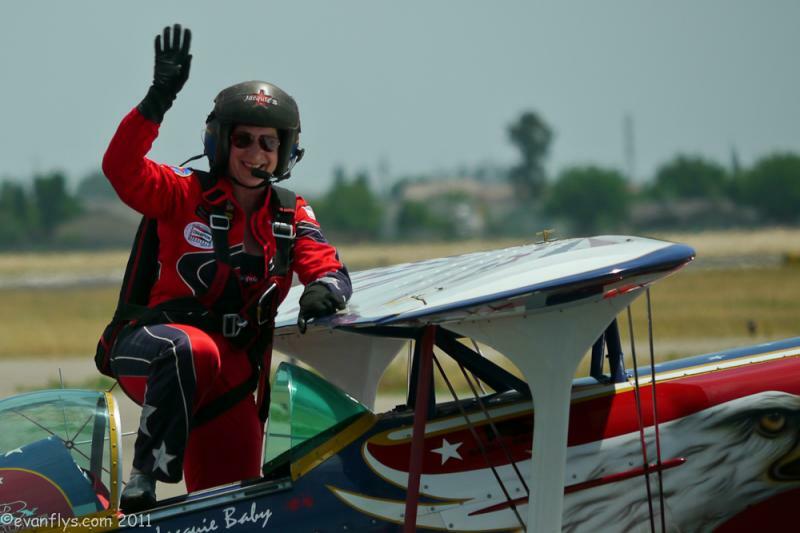 At the Marysville Golden West airshow, I got to interview aerobatic pilot Jacquie Warda who came to the show in her beautiful Pitts called the Red Eagle. Jacquie does amazing performances and I was very lucky to be able to interview her. Here’s our interview. Hope you like it! Were you interested in flying as a kid? “The obvious answer is yes, I was. My dad was coming back from Korea, and that was in 1955. I remember being about three feet tall and my father coming in, and he was not in the Korean War but he was a contractor for one of the aerospace companies, and he had been in Korea for a while and he came back and he was wearing this dark green flight suit. He brought some presents and stuff but the flight suit that he was wearing; I just thought that was awesome and I knew he worked around airplanes. I'm 55 years old now and I can still see that picture in my mind of my father when I was about two or three, standing there in the green flight suit and I think that was probably the first thing that got my attention. Then of course the photos of airplanes came afterwards because my father worked around airplanes, so I loved airplanes like my father did. “When he was in Korea he bought his first 35mm camera. It was his pride and joy. Absolutely. He always wanted to have a nice expensive camera and he brought back maybe 50 rolls of film and they were all pictures of airplanes. You would think that if you're traveling around the world you'd be taking pictures of castles and monuments or whatever but it was all airplanes. So as a little girl we would look at slides, and my dad had trays and trays and trays of slides and whenever he had a new roll of film we would sit down and watch slides on the wall. So I started looking at airplanes when I was around three. Nothing but airplanes. Of course, I didn't know anything about airplanes but that's when it started and as I got a little bit older I would occasionally get to go with my dad to work or he’d do something around an airplane at an airport. “When I was in fifth grade, we lived in Santa Maria, CA which is where Vandenberg Air Force Base is. My Dad spent about three years working at Vandenberg in the missile project. My dad's expertise was in power plants including jet engines. So we lived in Santa Maria for about three years and every time there was a launch at Vandenberg, no matter when it was, my dad took us to the launch. And quite often the launches were later in the day, or at twilight, or at night, and I have vivid memories of sitting on a blanket out in the grass someplace away from the field to watch these launches. And we never missed a launch. It never made me want to go into space, but I always wanted to fly. When did you get your pilot’s license? “When I was in high school I really started thinking about learning to fly and actually giving some serious thought to could I afford it, and was I smart enough to do it. I was really hung up with the idea that I didn't know any women that were pilots. All the pilots I knew were friends of my dad, and they were all guys. So here I was, being a girl, thinking I haven't seen any girls fly …. maybe girls can’t fly. It took me a few years to figure out that yes, girls can fly. They're capable of doing it, there just aren't very many that do it for various reasons. So I thought, okay, I'm going to have to work really hard to do better so that they'll let me, and well, I was worried that I wasn’t smart enough. Now I remember as a kid looking inside an airplane and I don't know if you remember when you look at panel in an airplane is about a couple of feet wide and it has 100,000 things on the panel and you go ‘wow I'll never be able to do that that's just too difficult, too complicated, who could ever learn to do all that stuff?’ So I was worried that I wasn't smart enough and that's one of the reasons why I thought maybe girls didn't fly because maybe girls aren't as smart as boys. This was interesting because I had straight A’s in school I was a very good student. Girls tend to be smart, I had no problem studying. Boys tend to want to play more. “Boys want to play more. It's not that they're not as smart as girls it's just that girls tend to be more focused and if we please you by getting straight A's then that's a really good thing for us. So I had good grades and I knew I was pretty smart but I thought maybe I'm not smart enough to learn how to fly an airplane because I thought it’s got to be really, really tough. So that was the one thing that kept me from actually going out and doing it. I was afraid to ask for fear someone might say, ‘sorry you're not smart enough to fly an airplane.’ I didn't want to hear that. I was very afraid of that. So I kept my mouth shut and didn't do much about it for a lot of years. “But I also knew that it was going to be very expensive. So I thought, ‘okay, if I can save money and I can work really hard, but I'm still going to have to take that first step and finally say okay I want to try and if I don't try I’ll never know.’ I was 32 years old before I had enough money I thought, of course I didn't have enough money as it turned out, but I had enough to start. I was living in Spokane, Washington at the time and I knew when ground school started. I knew where ground school started. I knew who the instructors were and how much it cost. And I had known all that for years, I was just too afraid to go. So I woke up one Tuesday morning and I said to myself: ‘I am tired of hearing myself say I wish I could fly an airplane.’ And that Tuesday night, I walked in the door and I paid my money and I said, ‘I'm here for ground school.’ There wasn't another girl in the class and there were about 10 guys aged 18 to 40. They all looked at me like, ‘you sure you're in the right place?’ But I walked in and said here's my money and I started ground school. I was so scared. I was so afraid of not being good enough so I can tell you that I studied harder than a normal person would. I was not going to let them get the better of me. So I passed my FAA written test and I think I missed l one question. I got the best grade of all those guys in that class. So I was 32 years old and all of a sudden I realized that #1: I was smart enough to fly. I hadn't done a whole lot of flying by the time I'd passed my written, but I realized I was smart enough to learn how and I did all this stuff and #2: that just because guys are pilots doesn't mean they're smarter than me. So I was 32 when I started flying. “I'd gotten to know most everyone at the airport because I was the only girl flying, that was simple, and this one guy came up to me after I'd been flying my Cessna one day and he said, ‘I'm going to take my Pitts out and would you like to go along? 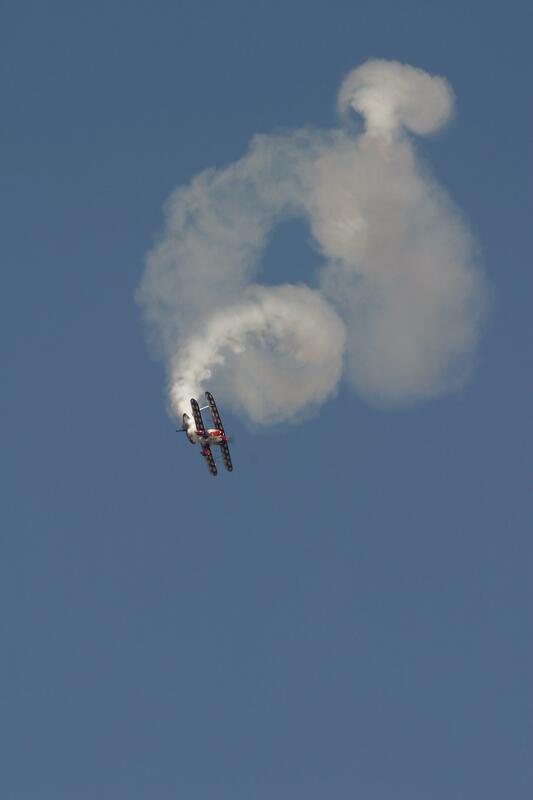 He had a Pitts S2B. And of course I thought I was the luckiest girl in the world and I said, ‘Are you kidding? Definitely!’ I had been waiting and hoping he would invite me as I was afraid to ask for a ride. 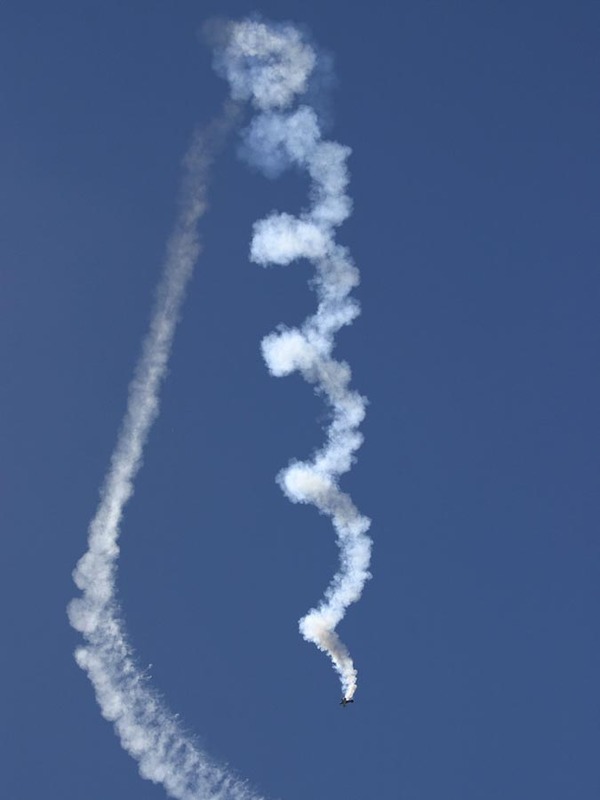 “So we go for a ride and as soon as we departed from the airport and got away far enough he said, ‘let's do some aerobatics.’ I was scared to death and I didn't know what to expect. He said, ‘I’ll start with a roll.’ And I remember finding something to hold onto and of course I'm strapped in very tight but I just had to hold on because I was very nervous. So he rolled airplane once and I just thought it was as though I had just gone to heaven. Oh my god, it was so much fun! “It was so awesome and I just couldn't get enough so we did lots of rolls and loops. My time so far as a student pilot was getting pretty boring. You go straight and level the look around but there's nothing to do between the takeoff and landing - If nothing’s going wrong, there is nothing to do. I was bored to tears and I had 50 minutes between takeoff and landing to be bored. There's just nothing to do in the airplane. And I thought there's got to be more to flying than this and after my aerobatic ride, as soon as we landed, I thought to myself there IS something to do between takeoff and landing! “I have just found what there is about flying that's going to make me very happy. I was bored flying straight and level. I'd had a couple of emergencies, nothing major but when you're a new pilot everything is scary, and when everything is going right there is literally nothing to do. So here I just discovered that there was something to do between takeoff and landing and that moment I knew that's what I wanted to do with my flying. “Everybody wanted to know, ‘are you going to be an airline pilot, or an astronaut, our whatever,' and everyone wanted to know why I was learning to fly and the obvious just wasn't enough for people. Once I discovered that there was something exciting to do with the airplane, we flew the Pitts a lot and I realized just how expensive that was. Not only were we burning a whole lot more fuel but the airplane was going to be very expensive as well as the insurance. For almost 12 years to the day I dreamed about flying a Pitts. “That was my dream airplane that was the airplane I was going to have someday. I didn't know how but I just knew I would have a Pitts. 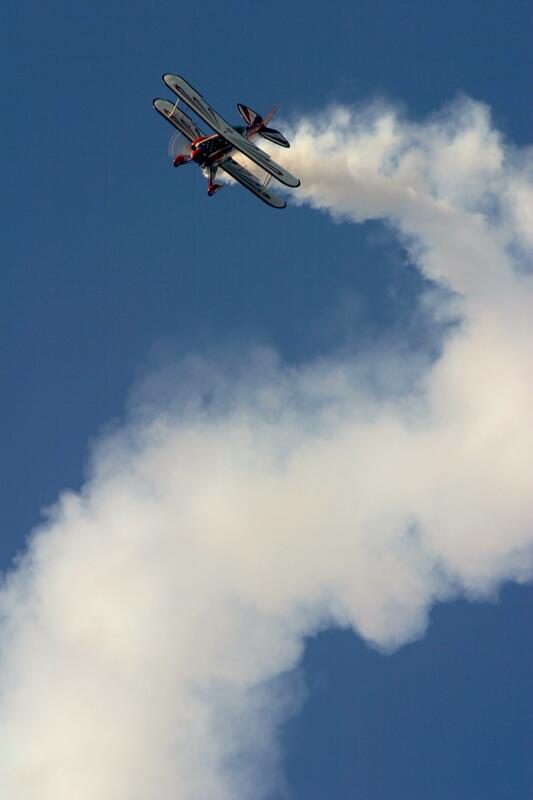 And it took me 12 years to get into the Pitts, to have enough money to fly. Back when I was a student I was flying the Cessna with gas for about $50 an hour. Flying the Pitts was $300 an hour so it was a huge step up for money so now I'm working twelve hours a day instead of eight to pay for all this flying. “Eventually I left Spokane and went to Portland and I worked for an FBO called Flightcraft. I wanted to be around airplanes so I went out to the airport looking for a job and I figured I could be a secretary on the airport as easily as I could do something in some office someplace so that kind of got me back on the airport and being around airplanes, and the more you hang around airplanes, the more flying you do. 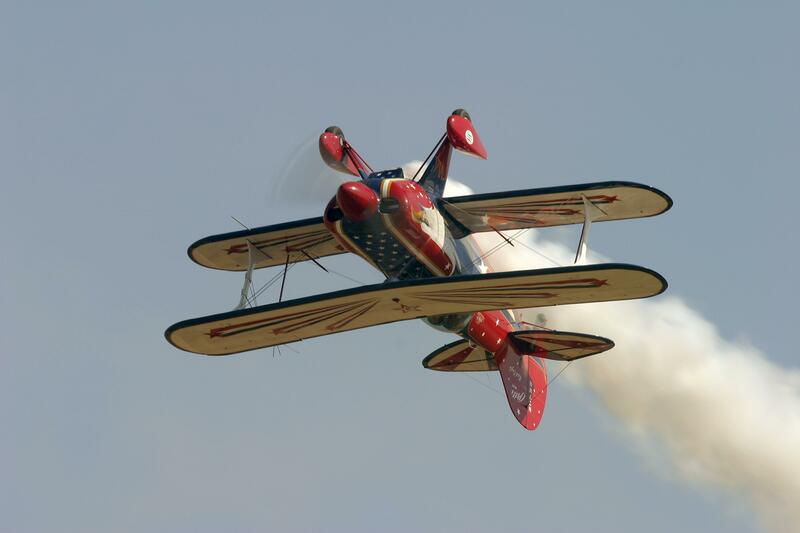 Why did you choose aerobatics? 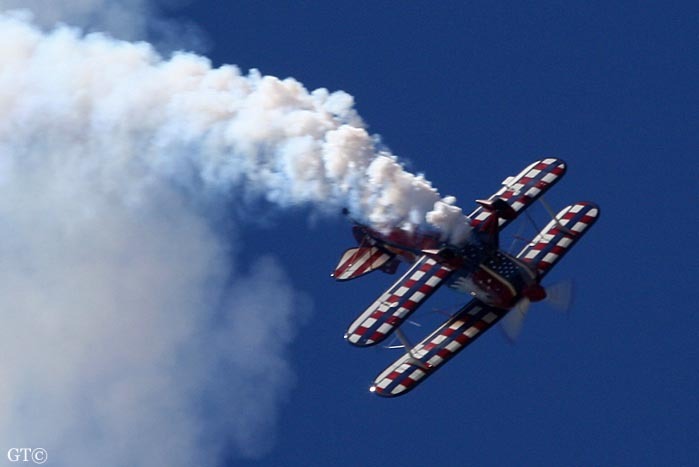 “I could have maybe flown aerobatics for five years and then said no, I wanted to something else, but I learned lots of different things like air racing and things like that but aerobatics is the one thing that I want to do every day. I have learned so much about flying, about my airplane, about what to do when things get ugly and the confidence that I've gained in surviving all these things has made me a tremendously smart pilot. Not so much something that you learn in the book. You can read every single book about aviation that you can, but there are a lot of things that you won't learn unless you actually go out and do it. So I can turn my airplane upside down and I can pull the power off and I can shut the engine down and I know exactly what the airplane will do. There is no question in my mind in any place that I get my airplane, there’s no question about what it's going to do, I know what's going to happen in the airplane, and there is no guessing. I know I'm smart enough to survive broken propellers and oil pressure going to zero, all kinds of stuff I’ve survived. See, stuff that I always hoped would never happen to me, I’ve survived so I believe if I get into an airplane and something goes wrong I stand a really good chance of doing the right thing. There's a lot of confidence because the way we fly our airplanes, as hard as we fly them, we can break them by pushing to the limits all the time. You fly a Cessna all day long I don't think you would worry so much about breaking things because you're not doing anything to it that's going to make it break. I'm flying an airplane that's designed to do what I do but even still, you know you pull hard G’s one million times, and you may break something on the one million and one time so you just never know. “So let me tell you what it feels like to twist and turn. Have you been to a carnival or Disneyland? “Okay, let me tell you what it's like to fly the airplane all the way up here but then go straight up and then you run out of energy and you just start falling down, if you can imagine. You know that twirling teacups, those twirling teacups that you find in the carnival? The more you pull that wheel the faster it goes around, if you can imagine that feeling and then take those teacups and if they went off the platform and then they went around and around. “It's hard to imagine because there isn't anything you can do on the ground that would be just like it so I could talk to you and tell you everything about it but when you got in the air and did it, it would actually be different, so it's hard to describe to people what it feels like because they can’t compare it to anything. It's not as fast as it might look. You can stand watching the sky and you can see the airplane going around and around and you can think that looks really cool or looks like it’s really going fast but from where I'm sitting it's about half as fast as you think it is because the thing is, when you tumble an airplane you don't do it at high speeds. We want to tumble going up towards the sky and not to the ground, so as soon as you pull up the airplane starts to slow down. When I tumble the airplane, I do it at less than 140 miles an hour. This lessens the chance of breaking something. If you’d shove the stick forward and do something very violent, there's a very good chance you'll break something because of the speed. So tumbles are done at low speeds, as soon as you start swapping ends you're getting slower and slower. “So I will be tumbling and the last revolution around the plane is practically at zero airspeed, going so slow, and then I know I have to start doing something because we’re about to run out of energy and now it's time to do something different. So it's hard to describe. It’s awesome. I never get tired of it. Can you share some cool stories with us? “The landing in a cow pasture, that's a good story. See, my propeller isn’t a fixed pitched propeller, it’s a constant speed prop and inside the housing where these blades are, there are pins that stand out inside the hub that the blade hits it to limit the travel. They're called pitch pins and it stops the blade pitch from going too far, so it stays within this range and there's two things that stick up and the blade hits a back and forth as the pitch changes. Well one of the pins sheered off as the blade changed pitch which allowed the blade to keep turning. At 2700 RPM, you've got these two blades going to run around and suddenly one is not synchronized with the other so at 2700 RPM you get catastrophic vibration. It gets the whole airplane vibrating very badly. “I’m in Oklahoma about 13 miles from my next fuel stop. I'm actually going in to get fuel, so what I tend to do just to break up the monotony, when I’m flying along, when I'm getting ready to descend and get fuel, I go from very high, I pull the throttle back a little bit and push the nose down a little bit just to go really fast to give me a chance to get up to redline and just lose altitude quickly that way. Most people will lose altitude slowly but I'd do it for fun and push the nose over go really fast, and when I did that I was at about 200 miles an hour when the pin broke. So not only was I going real fast but now because I was going through the air so fast this vibration was really bad. “Well from the time that started to the time I was actually on the ground was twelve seconds which is not a very long time. So why I did or didn't do certain things, there's no question I have no idea, but what happened is as soon as that happened the airplane was shaking so badly I can't read anything on the panel that's how badly the airplane was shaking. My head was hitting the canopy and I'm really thinking that if it continues too long, the airplane’s going to break and things will break off this airplane. It's that bad. I can't even begin to describe for you when I can't read anything. On the radio I started saying ‘Mayday, Mayday, Mayday’, and I could hear myself say this and the radio was still working at that point. “I looked straight ahead and I saw a county road and it was actually, literally a very straight line right in front of me and it was just the perfect place to land and it was a dirt road. It was kind of red because the dirt in that part of Oklahoma is red clay. Well that was my spot. I had figured that's where I'm headed, I'm going to go down right there and land. What happens when you look ahead, if you look up to that cloud, your eyes focused on the cloud, I don't see clearly but my focus is right there so what happened is as soon as I made that decision to land there, my eyes come back into the cockpit and focused on what's right in front of me and I saw the power lines. “I was coming up to a major power line. It was like an intersection of power lines coming at me, like 500 wires and so in this descent I saw the road but I didn't see the power lines I was coming up to. So as soon as I saw those power lines, and I mean literally I had 2 seconds to avoid, them so I hauled the airplane to the right. Now I only needed go to the right because I was taught as a student pilot to always be looking for a place to land. In my flying I always say to myself in my mind right is a good place, left is not good, forward is okay, I can turn around and go back to five o'clock. So as I'm flying along I pick spots if the engine dies; now this is where I'm going to go. I knew that to the right was good and going to the left would be bad because it was a sloping valley that went down hill so I instantly knew the only place to go was to the right. “I would've hit the power lines and I wouldn't have had time so I hauled the stick and the rudder and I just yanked the airplane over to the right and within a few seconds I was landing in this field and it was a cow pasture. It looked flat but flat is relative! Now I knew that I was still really, really fast. I couldn't even get my hand on the mixture to cut the engine. I couldn't find it; the airplane was shaking so badly. I just know that I'm going to have to get this thing on the ground and I'm going to try. I was too low to even bail out so I know that as fast as I'm going, it’s too fast to land and I had to slow this airplane down before I hit the ground or it's going to just tumble over and I'm probably going to die. It is very likely I'm going to die doing this because I'm going so fast, or so it seems. “So I thought as I’m coming in, if I can, as I get closer to the ground and I can hold the nose up, if I can drag the tail on the ground to slow me down to be like someone pulling at me to slow me down because as soon as those main wheels come down, it’s not really flat it's very bumpy and I know that as soon as those mains come down, the mains are going to stick, the airplane’s going to probably cartwheel over and hit and at that speed it’s going to take me tumbling and that will probably kill me. So I'm dragging the tail and I'm just about stalling the airplane and I can feel it wanting to break off to the left. I was getting slower I couldn't hold the nose up any longer and I literally just braced for it because I knew that when the mains touch, it’s probably going to pitch forward and I thought this is it, it was all I could think about, this is it, that there's nothing and no more that I can do. The mains came down, the airplane actually rolled forward and it stopped. It stopped about 50 feet from a barbed wire fence. “I had slowed the airplane down enough that when the mains came down it just rolled. I didn't have enough speed to make the airplane spin or flop forward and nose over. I had successfully slowed the airplane down by dragging the tail. I'm sitting there in the airplane just comes to a stop. There’s stuff hanging all over the place, you know cables had come off, and I'm sitting there and it’s about 4:30 in the afternoon and I've got a little pouch on the side with my cell phone is still in there and it hadn't come out! I looked over and I grabbed my cell phone and looked at it and had five bars! I mean, I'm in the middle of nowhere in Oklahoma and there’s literally nothing around and my cell phone has five bars! That would’ve been a great commercial. “Well, I managed to get my GPS to come back on and plug everything back in the GPS to make it work and I wrote down what my coordinates were. Well, I told you I was going into land and this airport was 13 miles away and I made a mayday call, it was on their Unicom frequency, and these guys in the office heard my call so they started calling me. They were calling back and by the time I got the radio hooked up again, the cables had just come off on the back, I was able to hook them back up, bring the radio back on, and they were calling me and they are saying that we heard you and we'll be right out to find you and they said, they’re launching. They’re going to fly out over to find me. So I give them my coordinates and I told him where I was and sure enough they showed up shortly in an airplane and circled around and saw me and I talked to them on the radio. I said I'm not going anywhere and they said we'll be back to get you. In the meantime, before the guys found me there circling overhead, there was a farmer who had seen me in the sky and heard this loud crash and what he heard was the propeller blade pitch pin breaking. I got out of the airplane and I was shaking badly. I took a minute to collect myself. I really thought I was going to die in that landing. So here comes this farmer. His name is Neil McKinley, and we're good friends now, and he was very matter-of-fact. Here we are in the field and the cows are going to be here in about an hour and we’ve got do something to protect the airplane in case we can't get it out of the field today - were going to have to build a fence around this airplane. And I thought, ‘okay I'm a city girl. Whose got the time to build the fence, and I'm thinking a wooden fence. I really didn't know what he meant, I just thought well, it's a peculiar thought but okay, whatever. So he says, ‘jump in the truck with me, my house is just over here about a quarter-mile and we’ll go get the stuff, come back and get a fence set up because the cows would eat the aircraft’, they would actually walk up to it and chew on it and they would destroy the aircraft just sitting in their field or just because they be curious. So by this time the airplane that had spotted me, they said they would be back for me, I didn’t know what that meant, but they said they'd be back later. It turns out they pulled many airplanes out of the fields and they knew what they were doing. So we get to Neil's house and Neil starts loading these metal poles and a big huge spool of wire and it turns out that he's going to build an electric fence around my airplane. All he has to do is stick these metal things with a clip attachment and we just run this wire. You run it around all these posts around there and you plug it into the battery and you turn on and now you've got an electric fence to keep the cows out. It would've taken him 10 minutes. By that time I'd taken the wheel pants off because I knew it would be hard to move it out of there without hurting the wheel pants so I had taken those off. He knew how to hook up the airplane to the cable and they winched it straight up this onto this thing and rolled it back up on to the truck and drove it into town then unloaded at the airport. A friend from Phoenix came out to get me and took me home to San Francisco and a few days later I flew back with a propeller, put on the propeller and I flew the plane home. I hadn't put a scratch on the airplane. “Before we left the field, I walked around and you could see in the weeds where I dragged the tail and I walked back that line and that tail went alongside every single hole, it went between every hole. If I had dropped the tail in there, it would've pulled the tail right out of the airplane. But I missed every single hole. It was about 100 yards long that I was dragging the tail and not one hole that I hit and if that wasn't karma, or someone watching out for me, I don't know what that was. That's the most exciting thing that ever happened to me in an airplane. I've had a lot of not so exciting things happen but things can break. I tell that story a lot. When I talk to kids at schools almost without fail, the first question they ask is have you ever crashed. Obviously I'm still here so what they want to hear is the story about the fiery crash. For some reason that's very exciting to kids. I landed the airplane in the field but I call it an “off - field landing”. Because I've done it once, I know it can be done again. If I'm ever in a situation like that again and I have someplace that's relatively flat, I know that I can put that airplane down and do a fairly good job and not worry about breaking it, I mean that's possible, but you can always replace it. But I want me to live. There are pilots out there that have never done that, so they're not quite sure that they can do that, but I know that I can because I've done it. I was very lucky to meet and interview Jacquie and I can’t wait to see her fly aerobatics again! Be sure to check out Jacquie's website - it's really cool! Special thanks to Jacquie Warda for the great interview, and my dad for, well, everything. Second two pictures and the last two are by me and my dad. The rest are courtesy of Jacquie.